CJU 2016, one of the year’s major affiliate marketing events. This was my fifty-eighth time addressing people from stage but my very first time speaking at a CJU. The room full of over 150 digital marketing managers of Fortune 500 companies was a perfect place to deliver my perspective. I’ve been pondering on this for some time, pointing to the problem five years ago in one of my books, and it was good to have the chance of driving the point home with such a targeted crowd. Affiliate marketing is not a marketing channel! …but why should anyone care what we call it, you ask? If you want me to cut straight to the core of it, here is my answer: When affiliate marketing is perceived as just one of online marketing channels (as presented here, here, here, and in many other places), it is being treated as just one of the available avenues to carry the marketing message from the brand to the end consumer. As a result, when budgets are being allocated between the channels it is competing (for the attention and funding) with the brand’s own paid search, email, retargetting, display, and other marketing efforts. And guess where it lands? 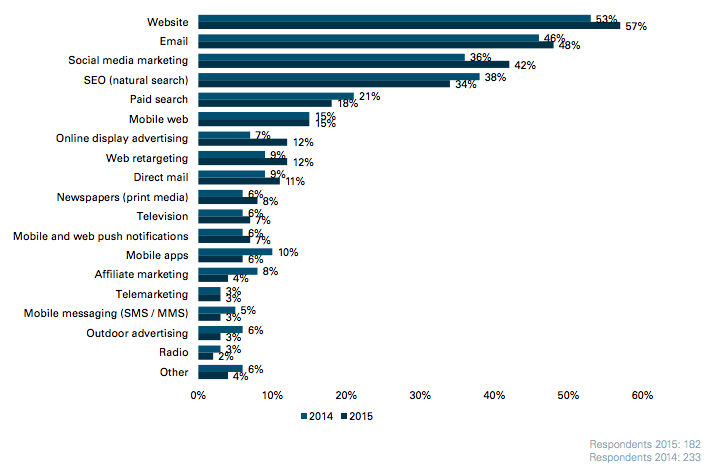 According to Econsultancy/Oracle’s Cross-Channel Marketing Report 2015 affiliate marketing is number 14 on the list of marketers’ priorities (just a notch above telemarketing). 1. Awareness Phase: Here you can lever the efforts of display advertising affiliates (like SmalBizTrends.com), monetization tools (like Skimlinks and VigLink), ranking sites (like TopTenReviews.com), and social media influencers. 2. Consideration Stage: On this phase, producers of textual and visual content, data feed affiliates (like ShopStyle.com), pay-per-call publishers, and those producing product/service reviews can help lubricate the path to conversion. 3. Action Phase: Finally, such affiliate types as charities and fundraising organizations, loyalty and rebates affiliates (note: they are not compatible with PPL affiliate programs), and retargeting arrangements (with technologies from UpSellit, ve interactive, and others) can help you close the path to conversion. Additionally, there are also cross-phase types of affiliates out there: from email marketers to mobile-oriented publishers, and from pay-per-click specialists to sub-affiliate networks.